Thank you to the many people who sent me links to the various reports of this discovery and commented on how wonderfully it suited my theory on the purpose of Stonehenge. “Stonehenge was a Welsh monument from its very beginning. If we can find the original monument in Wales from which it was built, we will finally be able to solve the mystery of why Stonehenge was built and why some of its stones were brought so far.” Mike Parker Pearson, archaeologist who led the study. Click on image to go to University College London website and the full story. I could not be more delighted by this discovery. In my recent Cambridge University Press book, Knowledge and Power in Prehistoric Societies, and in my forthcoming book, The Memory Code, I offer a new theory for the purpose of Stonehenge and monuments around the world. The new findings in Wales fit the theory a treat. My research is on the way non-literate cultures memorized vast amounts of practical information when they had no way of writing it down. All oral cultures used a combination of memory techniques and physical devices – their survival depended on accurate retention of practical information on plants, animals, navigation, genealogies, astronomy and timekeeping, seasonality, resource management, intertribal agreements and so on. The memory technology employed universally is the ‘method of loci’ or the ‘art of memory’, the use a sequence of physical locations to act as a set of mnemonic subheadings to the knowledge system. The information for each location is then stored in song and mythology, stories and dance – all kept in memory. Stonehenge was built in the transition from a mobile hunter gatherer society to a settled farming community. Mobile cultures used a range of landscape locations to store information, such as the Australian Aboriginal songlines. The ancient Greeks and Romans used their buildings and streetscapes in the same way, attaching information to each location and then recalling it by walking, or imagining themselves walking through their memory sites. Modern memory champions refer to their sequence of locations as memory palaces. What happened when hunter gatherer cultures started to stay in one place, an essential development if they are ever to farm? They were no longer moving between their landscape locations over the annual cycle but didn’t yet have a built environment. The simplest thing to do was to replicate their landscape sequence locally, such as with a circle of stones or posts. The original monument at Stonehenge is now considered to have been a circle of stones or posts, possibly the Welsh bluestones. The huge stones in the centre, the familiar sarsens, didn’t come to the monument for 500 years after the first circles. I have argued in my PhD thesis and both books, that the bluestones were particularly suitable as memory locations because of the variety of textures and colours in their material made them visually so variable which is great for encoding information. 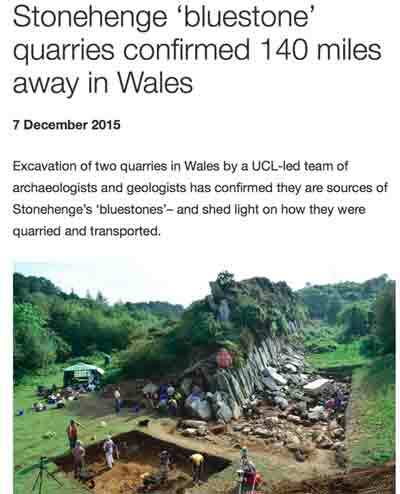 I thought that the builders brought the stones and knowledge of the method of loci from Wales. If Parker Pearson and his team are right, then they brought their entire memory palace! I could not have hoped for a better development. The Memory Code will be published by Allen & Unwin in July 2016 in Australia and later in the UK by Atlantic Books. I am an Honorary Researcher at LaTrobe University. I am the author of 17 books, the most recent being 'Spiders: learning to love them' (Allen & Unwin), 'Knowledge and Power in Prehistoric Societies' (Cambridge University Press, and 'The Memory Code' (Allen & Unwin, AUS; Pegasus Books, US and Atlantic Books, UK). My new book 'Memory Craft' is about how to apply the indigenous memory methods - and many more - in contemporary life. It will be published on June 3, 2019. This entry was posted in archaeologists, archaeology, art of memory, Australian Aboriginal, British Neolithic, Cambridge University Press, indigenous memory systems, Knowledge and Power in Prehistoric Societies, memory devices, Memory Spaces, method of loci, mnemonics, songlines, Stonehenge and tagged archaeology, art of memory, Cambridge University Press, indigenous, Knowledge and Power in Prehistoric Societies, memory, Memory Spaces, memory systems, method of loci, Mike Parker Pearson, mnemonic devices, mnemonics, Neolithic, Stonehenge. Bookmark the permalink.